Print information about the goal. Definition at line 62 of file Goal.h. Definition at line 77 of file Goal.h. Definition at line 87 of file Goal.h. Return true if the state satisfies the goal constraints and compute the distance between the state given as argument and the goal (even if the goal is not satisfied). This distance can be an approximation. It can even be set to a constant, if such a computation is not possible. The default implementation sets the distance to a constant. If this function returns true, isStartGoalPairValid() need not be called. 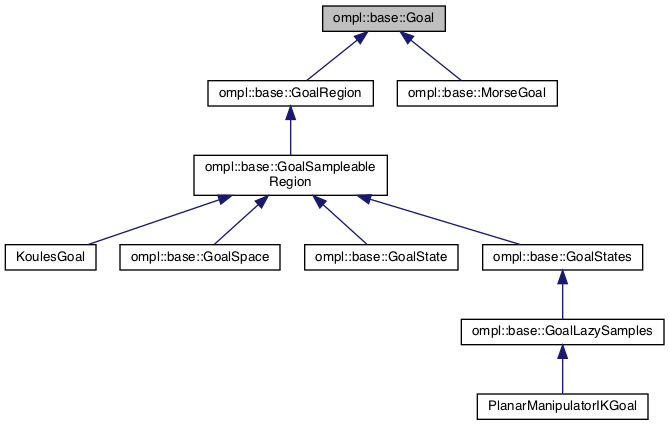 Reimplemented in ompl::base::MorseGoal, and ompl::base::GoalRegion. Definition at line 45 of file Goal.cpp.